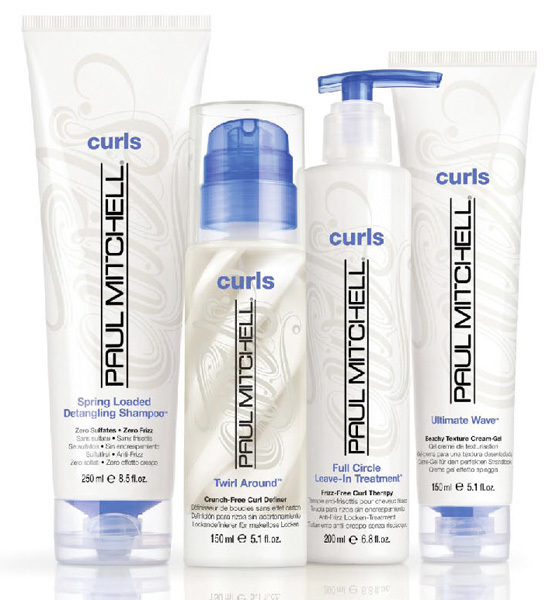 Last month when I told you about the fun Paul Mitchell The Truth About Curls campaign, I mentioned that there are some new Paul Mitchell products made just for curly hair. I promised I would tell you more about them, and here they are! Spring Loaded Detangling Shampoo™ - This sulfate-free shampoo cleanses hair while leaving hair hydrated and conditioned yet not weighed down. Curls are fizz free right out of the shower. Full Circle Leave-In Treatment™ - This lightweight conditioner is left in hair to keep hair soft and manageable, while not weighing down the hair so curls can look their best. Twirl Around™ - This double duty product is a gel and cream that is mixed together right in the bottle so you get the perfect amount of each. The hybrid helps to manage curls, while shaping them and keeping them soft and looking pretty - never crunchy. Ultimate Wave™ - This styling cream is the ultimate helper for wavy or curly hair. After hair is styled, rub a small amount of this into curls to separate and add texture into the hair. I hate waves that just sit there, so Ultimate Wave is my new favorite hair styling product. I usually just style, hair spray and go. By using just a bit of this cream, and I mean a bit - like the size of a pea, my hair has movement and looks more natural. I rube the cream into my hands and just run them through my hair. The cream defines defines the wave, while it adds more volume to my look. To buy these new hair care wonders, you can find a salon with the handy salon locator from the Paul Mitchell website. Don't forget about the special The Truth About Curls Facebook page. In case you haven't checked out all of the Curl Confessions over on the site, be sure to do so. Take a few mninutes to share you very own curl confession to be featured live on the site. I love to hear how real women deal with their hair dilemmas. It makes me realize that I am not in this alone. Plus, I learn new ways to manage my very own love/hate relationship with my hair. If you do leave your own Curl Confession, please let me know so I can check it out! Disclosure: This is a sponsored post from Paul Mitchell. For more information, please see my disclaimer page. Makeup Wars: My Favorite Fall Look.